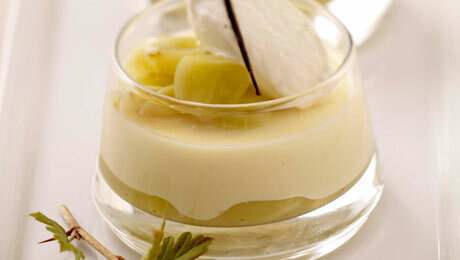 The sweet creamy mixture and sharp gooseberry compote of this Italian dessert create a fantastic taste. Wash the gooseberries, drain well and remove any stalks. Add in the lemon juice and the cinnamon stick and bring the mixture to the boil. Simmer for 10 minutes and then allow the entire mixture to cool down. Taste the mixture at this stage, gooseberries by their nature are sharp but I like to leave them quite sharp tasting as this compliments the pannacotta, but you can add additional sugar if you wish. Soak the leaf of gelatine in cold water for approximately 8-10 minutes, ensuring that it is fully immersed. Place the cream, vanilla and sugar into a large saucepan and bring slowly to the boil. Take the boiling cream mixture off the heat and remove the vanilla pod. Using a sieve strain the water off the gelatine. Give it a good shake to get rid of excess water and add it to the boiling cream once removed from the heat. Divide the mixture between the glasses (no need to fill them up fully as the mixture can be quite rich). Pour the mixture quite slowly to stop the fruit from getting all mixed up and you will be able to see the two definitive layers. Chill in the fridge for at least 3 hours and then serve.